If you have chance going to London, what will you do? Shopping, eat out or just sight-seeing? Some of my friends shopping in London are worth due to high currency exchange rate but to me it is not. When I travel in London in year 2003 during year end, it was sales period too. I noticed the price is much cheaper when I converted to our currency rate. The must see and must go attractions are London Eye and Tower Bridge, remember the song : London is falling down, falling down….? I bet all of you knew about this song. Of course, when you are in London, you need a place to stay. Usually I will look for cheaper hotel rate before I go for any vacation. As for London, you can check out cheaper hotel rate in Cheaperthanhotels websites. The site offers variety of cheap hotels rate for hotels in London, Hotels in Manchester, Hotels in Birmingham and many more. 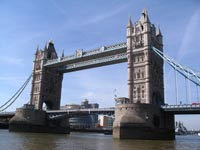 Cheaperthanhotels also provides last minute deals for those who wish to go London in a short time. Check out Cheaperthanhotels for your next London trip!